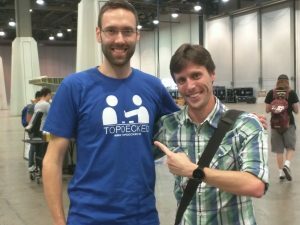 Wednesday before the tournament, I flew in with the rest of Team TopDecked (Mark Evans, David Riegel, Mike Howe, Bill Schlichting, and Mike Langas were all sporting TopDecked Tees). we unloaded in our hotel room, got some food at a local Thai restaurant where we promptly ran into Craig Wescoe and some of his friends. The food was great, but patronage was suspect 😉 After getting back to the hotel room, we go to bed “early” around 10:30 (1:30am our time,) and I woke up at 4am — 5.5 hours of sleep, not enough. Two 8.4oz cans of energy drink + ice in a hydro-flask, and some homemade oatmeal-cashew bars my girlfriend made (thank you!) help me power through the first day. I had won two byes from 7-0’ing a local GPT in Charlotte, NC, so even though I didn’t get a regulation 8-hours of sleep, I got a good workout in the morning before I started and started the day strong at 2-0. Getting the blood flowing (plus caffeine) definitely helped me start out alert for my first actual match. I feel this contributed significantly to my performance on day one. This was also the first day TopDecked was sending out mobile pairings to players at Grand Prix events using our mobile app, so I had my computer in my bag, and between rounds I opened it up to make sure that everything was running smoothly. I was a little stressed trying to play and work. I’ll cover the GP first, then the Legacy Double-Up Challenge, and a few more words about TopDecked and Mobile Pairings below. Here is my decklist for the weekend. First match of the day. I am on the draw. This one is over fairly quickly in two games – my opponent is on the play with a turn-one Deathrite Shaman, but doesn’t find a fetchland to turn it on for several turns. I play my own Deathrite Shaman, so I am able to quickly establish, deal with his shaman, and crop-rotate for the combo on turn 4. His suspended Ancestral Visions on turn two never resolved. Game two, my opponent has another slow start. No DRS this time. I am able to play my own Deathrite on turn one and on turn two, Wasteland him, cast Life from the Loam, and keep him land-locked for several turns. At 8 life, after several Deathrite activations, I’ve played a Snapcaster Mage and a second Deathrite – he conceded. Super nice guy – said he had been out of Legacy for about 6 months and wasn’t sure he wanted to stay on Shardless since it seemed “outdated.” I’m not sure I agree about that, but I do agree there are many more viable choices now that Miracles is “gone”. This is a typical Delver’y match. He is on the play with a turn-one Delver of Secrets that flips naturally on turn two. I don’t have an answer for several turns, and he gets 15 points of damage out of his single threat. I finally find an answer with five life remaining, fetch down to two life over the next several turns, start the Loam/Wasteland engine, and kill him with the combo after activating on my main phase to avoid Wasteland. He goes from 17 life to -3. Game two is even more uneventful, as he never connects with a creature. He Forces my Deathrite and I play out lands and answers until again, I swing in to take him from 17 to -3. Flawless victory, 20 life remaining. Perfect, another fair deck. Pernicious Deed is an MVP in any stoneblade matchup. He manages to land a early True-Name Nemesis, riding in for 12 points of damage and Dazing my Toxic Deluge, (which surprised me slightly after seeing white, maybe it shouldn’t have) before I am able to resolve Liliana and stabilize with two life. I fetch to make mana for Marit Lage and win the game with one life left. Game two he plays another True-name which I clean up with Toxic Deluge, then a Stoneforge and Batterskull that I (somewhat surprisingly) can’t find answers for. A loss. I vaguely recall never seeing green mana this game, but that might be a different match. Game three he takes care of my turn one Deathrite with Swords, plays another True-Name, counters my Toxic Deluge, but I was baiting him since I have two crop rotations for full combo in hand. He taps out to play another threat and I go off at instant speed during his end-step around turn 5 to bring him from 17 to -3, a popular life swing for this event, apparently. Another fairly straightforward BUG matchup, he wins game one with a very slow (non-flipping) Delver into two Delvers I can’t find an answer for, but I play BUG control in game two with a turn one deathrite, turn two a Collective Brutality that escalates to kill a Deathrite and strip a Brainstorm, revealing Tarmogoyf and Tombstalker. I then play a natural draw Bojuka Bog to empty his graveyard, preventing another early 5/5, then Liliana of the Veil next turn to kill Tarmogoyf and start working on the rest of his hand. Game three another flawless victory. I never take a point of damage and close the game out with Marit Lage. Yay, fair decks all day. This is a very interesting match. Typically very much in my favor, nearly unloseable, but I managed to give up a draw with a misplay in game two. Game one plays out fairly typically where I force an early crop rotation for my only point of damage, hold up several wastelands with Stifle for Vampire Hexmage and Crop Rotation for Karakas to stop him at every turn. I’m not running my singleton Ghost Quarter this weekend as I opted for Cephalid Coliseum, so he’s a little lucky, relatively, but I finish game one with a Snapcaster and a Deathrite Shaman. Game two is much grindier, as we are both playing for the long game. My hand is slightly slow, a few Force of Wills and a Crop Rotation — good enough. He plays several Duress, drawing out my Force of Will (trying to protect Crop Rotation). I eventually play a Snapcaster to start the clock, attack for several turns. He sees an opportunity and plays Surgical Extraction targeting my Wasteland. Since I’m fairly new to playing with DRS, and running on little sleep, I make a serious misplay that ends up costing me the game, and ends the match in a draw. Rather than use Deathrite Shaman to exile my own Wasteland and fizzle his Surgical (saving the utility of a Crop Rotation in my hand — which is basically a silver-bullet in the match-up), I instead play Crop Rotation to find a wasteland and put it on the battlefield (my old habitual play, pre-Deathrite). This resolves, he ghost quarters my wasteland, I target his depths. He makes Lage leaving me with one copy of Intuition and exactly six Mana untapped. I play intuition for Karakas, Liliana, Liliana, and he gives me Karakas. He’s tapped out, so the only card that can save him is Not Of This World — he has one card left in his hand. I play Karakas, activate, and he does indeed have it. I lose game two, and we draw the match since the clock runs out while we are shuffling. This is the only clear misplay I made either day, so I’m happy that it only cost me a draw, and I will never again forget about Deathrite in this scenario. Lesson learned the hard way. My opponent was a super-nice and unsurprisingly happy with a draw in this matchup. On we go. A friend of a friend —- it’s his Vegas Bachelor party. We have an awesome and fun match. Definitely the storm variant I would much prefer to play, as my deck has quick, main-deck answers in Stifle, Toxic Deluge, Pernicious Deed, and Maelstrom Pulse. Not knowing what he’s playing, I keep a hand with Snapcaster, Stifle, Stifle, Deathrite and three lands. Not great against some decks, but pretty good as it turned out in this match. Turn one I see Ponder, hold up Stifle for his lands rather than run out Deathrite immediately (max value!) then see Git-probe next turn and quickly decide that fetch-lands are now off-limits. Stifle is either on Wasteland defense (Delver) or storm duty. I play Deathrite next turn to start the clock — He finally finds enough mana to play Ad Nauseam at 12 life, but drops to three life without finding enough mana to go off without Past-in-flames, or committing deathrite suicide. He cleans out my hand but can’t finish the game. Game two, I sideboard in Flusterstorm, Invasive Surgery, 2x Surgical Extraction, Collective Brutality, 3x thoughtseize, crop rotation, and the second copy of Leovold, Emmisary of Trest. My opening 7 is insane: Force, Force, Stifle, Brainstorm, Swamp, Misty, Thoughtseize. Snap-keep. He mulls to six and goes off on turn one. Land, Dark Ritual, LED, LED, Infernal Tutor. I let this chain resolve (not worried about empty the warrens without a Tutor or Past in Flames in this situation since he showed me two LEDs), I cast Force of will and he concedes. I probably would have tried to rebuild were I in his situation, but it was going to be tough with the amount of hate I had access to. I was worried about this matchup coming into the tournament, so I played about 10 practice games against a Mike Langas (another member of Team TopDecked) on Wednesday night. It paid off. Game one I don’t really have notes about what happened. He fetched a few times, Forced something, then died at 16 life, so I can only assume I killed him with Marit Lage. I ended the game at 22 from a Deathrite activation. Game two he did his very delvery thing and slowly ground me to death with a few copies of Deathrite and a late Delver. Game three I won with 18 life after my opponent durdled for a few turns, git proved a few times, and then died at 11 from his own lands and spells after playing a Force of Will. It doesn’t look like he was able to get a threat to stick and that’s not going to cut it against Marit Lage. Another matchup I would consider favorable at this point thanks to Pernicious Deed and the rest of my sweepers. He plays turn one Aether Vial, turn 2 Stoneforge then Mother of Runes on my end-step, we swing back and forth a few times (he has a pretty slow clock as I believe I’ve wasteland him a few times to keep him under-curve), my Strix flying overhead. I’ve been holding Pernicious Deed (MVP in this match) since my opening hand, so I let him overextend a bit (4 creatures, Sword of Fire and Ice, and Vial), then play deed. After passing the turn and taking one hit from the Sword, I clean up the board and lock him out with Jace and Liliana (no notes about this here but that’s what I recall.) He concedes. Game two he gets me with an early Mirran Crusader that I can’t answer. No notes here. Game three I keep a hand with Two Toxic Deluge, Leovold, and a few lands. He has a slow start as well, but I sweep the board with the first Deluge, resolve Leovold, next turn and go into attack mode. I have him at four life after several attacks, but he finds Batterskull and swings in to stabilize. The clock runs out, and in an attempt to bring me from 10 to 0 in time, he finally taps out to equip Batterskull. I crop rotate for the kill and end the game in turn 4 of overtime. I’m shaking by the end of the match and go outside to warm up and gather myself. Close call! Another draw avoided. My new playstyle against grixis seems to be paying off, as I’m able to stabilize game one at four life and rally for the win. Game two ends with my favorite play of the day. He’s got True-name, Deathrite, and Young Pyromancer on board. I’ve been saving my Wastelands to play around daze (rather than attack his mana base and turn on Gurmag Angler even sooner). I play a deluge to clean up his creatures, then use both wastelands to leave him with zero permanents. He passes the turn back to me and I play Liliana… plus. A few turns of this, and if I recall correctly, he concedes to Leovold on the stack. Arguably a good match-up for me, and possibly my second misplay of the event, I lose game one to an aggressive start – I was able to gain two life from DRS, but he floods the board with prowess and I can’t recover from a spell-heavy turn. Game two I make Marit Lage with 12 life remaining. He blocks once with a Stormchaser Mage and I swing in again for the kill. Game three he plays a turn-one delver. I play a fetch land, pass back. His delver flips. He attacks once and passes to me. I play my second land, a dual, he attacks on turn three, I fetch for another land to decay the delver, fire it off, then stare at my hand full of an now uncastable Liliana, and Maelstrom Pulse, and a mountain as his Blood Moon resolves. I don’t have force, and my decay was wasted on delver. I suppose I should have expected blood moon, but for some reason it was off of my radar. I sometimes take a few hits from the delver before firing off a decay, but U/R can be fast, and my damage prevention reflex was on high alert. I pass the turn a few more times and a Bedlam Reveler finishes me off. First loss acquired. This is typically a difficult matchup for me in certain situations. With 20+ creatures and a combo finish, the deck can easily run me out of resources. Sweepers are effective, but frequently insufficient against the combo since only Pernicious Deed is effective at instant speed (and is really the MVP of the matchup sometimes). Force of Will is essential, and mana-denial turning into a quick combo kill with Marit Lage is key. This is not what happened in games one and two. In game two, he out-maneuvered me on the battlefield as I was a bit tight on Mana, and killed me naturally without combo. I think I still had only shown him BUG stuff. Game three went a little more typically, where we each postured for a bit, then I made Marit Lage and he ran out a few blockers to gain turns (which the deck is very good at doing since there are about 9-12 flyers in any given Aluren build, and Cavern Harpy is basically an infinite blocker.) He eventually ran out of blockers as I was able to eat his hand with Liliana, then finally Force a late Aluren. This opponent was particularly cool. We had a miscommunication about how I tapped lands for Crop Rotation to make Marit Lage, but we ran it back for the judge and worked it out. This is an auto-pilot play for me so I’d be surprised if I did mess it up, but I was running super tired, it was loud, and my opponent didn’t think I had, so it’s entirely possible. I was fairly sure I had announced floated mana (though it took me a second to remember which land it was), but we both remembered me tapping the Wasteland before sacrificing, so the judge ruled in my favor. I don’t feel great about this because I like to play clean and I emphasize clear communication as much as possible, but stuff happens. Game two Zach mulled to 5, but actually managed to land nine infect on me before I can stabilize. Unfortunately the card-disadvantage was too much and the game stopped being interactive pretty quickly. I filled the board with strix, snapcaster, and deathrite, and ground him out. Let’s hope for top-8 next time, Zach. Probably the most difficult delver deck to deal with, because it’s typically the slipperiest and most disruptive, and my deck did not run smoothly this match. I do have all the answers you need to win this match-up, but it can often be decided by who plays first (he did), and who finds more copies of Stifle and Wasteland. Game one I mulliganed to five and kept a few lands with a few spells. First two hands had zero mana-producers… ouch). He flooded the board with delver, true-name, and something else, but I was able to catch him off guard with a Pernicious Deed, leaving him with no threats, and me with five life. About six turns later, a Delver that fell to Cabal Pit, and a Tarmogoyf that decayed abruptly, he finally found a Lightning Bolt and a Forked Bolt to finish me off — I didn’t find anything to do — I had all the time in the world. Mull-to-five was too costly. Game two was another blowout as I mulled to six, played slightly sub-optimally, and couldn’t clear his threats before unloading the double crop-rotation in my hand that would have represented a victory. My opponent played correctly and flooded the board, holding up counter spells for my sweepers. A very delvery hand took me down in a disappointing end to a very exciting day. The time-shifted feature match we recorded never aired, which is a bit disappointing as the first game was at least a decent showcase of what my deck does: Blow things up and make a giant tentacle monster. I figured later that I could have tried to cast Crop Rotation for Bojuka Bog to shrink his 2x Nimble Mongoose and turn off his Grim Lavamancer, but I was still probably not going to be able to deal with them. Actually I think I may have already played the Bog earlier and he stifled it. That sounds about right. More notes next time…. 16th place with amazing breakers to sneak in at the top of the 37 point players! What an event. I obviously would have preferred to keep playing, but I’ll just have to keep working on it. I really can’t be much happier given that the deck I’ve been brewing for over two years now (and I, as a player who’s been 100% dedicated to legacy and building the legacy community in Charlotte, NC for over three years now) get to stand in the spotlight for a little while. I’m planning on writing up another article about my thoughts as a first-time “top-placing” GP competitor, a deck-brewer, and what I think about the state of diversity in the Legacy format, so stay tuned for that and also take a few minutes to check out app.topdecked.me, an app for iOS, Android, and the Web that is my way of giving back to the Magic community and trying to help people enjoy the game as much as possible. I took leave from my job to build TopDecked MTG, doing this full time, and as a player actually getting to USE TopDecked pairings (left) during an event for the first time (which was exciting) I have to say it definitely made my day less stressful, and I had a much better time hanging out between rounds without worrying about getting to the pairings boards or trying to use a website to get my pairings. I’m excited to continue to provide this to players at large and local events. An actually useful MTG app and website to help players find events and other players to play with (it has a mobile and web event search with filters that is pretty powerful). A way to promote Local magic and help stores run bigger events that don’t overlap and step on each other’s toes. An e/pre-registration app to let players register, pay for, and submit electronic decklists (with clear and easy editing after the fact) for events of all sizes. TopDecked is here to stay. We are also starting Team TopDecked, which is a community-driven team that anyone can join. You don’t need to be a pro-player and you don’t have to win. We want Team TopDecked to be an encouraging, positive group of players who like to play clean, help each other learn the game and play, their way. Team TopDecked should be an open and welcoming group of people at any event, and help show the magic community that playing magic isn’t just about “maximum prize value” — it’s about making great friends, taking care of each other, building relationships that will last a lifetime, and welcoming new people of all shapes, sizes, colors, sexual orientations/gender identities, and more. If you wear a TopDecked T-Shirt, it should mean that you believe in all of these values, so if you do, saddle up, follow us on Instagram, and expect much more from Team TopDecked in the coming months. Rnd 1: ANT: (2-0) – Legacy Subreddit Moderator Guy. Nice dude. I was running tired and he was very amicable. Rnd 2: ANT: (2-1) – New to Legacy Guy. Super nice dude. Also a software dev from Uber. Rnd 3: R/G Lands (2-0) – Funny guy. Super nice. Lands is a great matchup for me and I teach him a few cute interactions with Thespian’s stage and Wasteland. Rnd 4: R/G Lands (we ID, but I beat him anyway 😉 – Frank? L2 Judge. Super nice. Beautiful all-foil/miscut deck, matching my all foil/black border deck. He asks me if it’s the same list from top 16. I say yes. He freaks out later in a burst of hilarity as he realizes that I’m actually the guy that built the deck and placed 16th (he thought I threw it together to play the event at first. Who throws together an all foil BB list ;). Really a pleasure to play this no-pressure match that ended up with a huge blowout where I surgicaled all his Depths, and Molten Vortex, we each played a million permanents, then he gets punishing fire on board to keep me from Jace, the Mind Sculptor ultimate and prevent finishing him with snapcaster #1 that he’s keeping at bay with Maze of Ith. I finally ended the game by filtering with Cephalid Coliseum a few times, gathering 3 Deathrite and another Snapcaster. I played them all out on the same turn to get by his triple punishing fire, and maze of ith and do the final point of damage. Hilarious and very skill-intensive game. Thanks, Frank! Lincoln Baxter, III is a competitive Magic: The Gathering player and deck brewer, skilled with control decks. He enjoys the game, and making sure his opponent doesn't. When he is not playing, practicing, or promoting Legacy, he works as the owner of TopDecked MTG - a deck-list builder / simulator, mobile pairings app, collection manager, event finder, and more. An TopDecked production --- All rights reserved. Marit Lage artwork from OtherSideOfThePlanet. Wizards of the Coast, Magic: The Gathering, and their logos are trademarks of Wizards of the Coast LLC. © 1995-2016 Wizards. OCPsoft is not affiliated with Wizards of the Coast LLC.